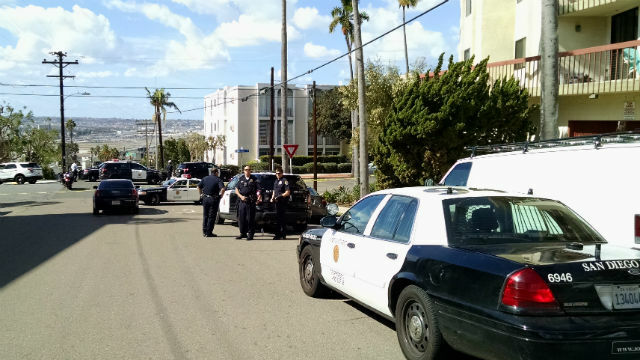 A domestic violence suspect allegedly opened fire on officers at his ex-girlfriend’s Bankers Hill apartment Wednesday before holing up inside for nearly 5 1/2 hours, prompting evacuations and road closures and forcing a suspension of flights at nearby Lindbergh Field. The armed standoff came to an end about 2:45 p.m. with the surrender of the alleged shooter, identified as Titus Colbert, 33, according to San Diego police. The ordeal began shortly after 9 a.m. when officers responded to a disturbance at the residence in the 2400 block of Brant Street, SDPD Chief Shelley Zimmerman said. The woman who reported the incident met the patrol personnel outside her apartment and told them she was not sure whether her ex-boyfriend remained inside, so they entered to check, according to Zimmerman. “As soon as they went into the residence, they were met with gunfire,” she said during a late-afternoon news briefing. The shots, apparently fired with a high-powered rifle, came through a closed interior door of the rental unit, Lt. Scott Wahl told reporters. “We’re talking within inches of hitting the officers,” he said. They retreated, uninjured, and called in backup. During the ensuing standoff, Colbert allegedly fired more bursts of gunfire periodically from inside the fourth-floor residence. The suspect’s ex-girlfriend was unharmed and in protective police custody, the lieutenant said. Officers cleared residents out of some neighboring apartments, closed the street in front of the building along with stretches of Albatross, Curlew and Front streets between Laurel and West Ivy streets and called in a SWAT team. Officials at San Diego International Airport, meanwhile, ceased all flight operations for about a half-hour as a precaution, beginning about 10:30 a.m., according to the Federal Aviation Administration. Departures were then resumed, but arrivals remained suspended, since the runway lies just across Interstate 5 from the neighborhood where the standoff was ongoing. About 2:30 p.m., the FAA announced that planes were being allowed to land at the bayside airport again following word from police that the suspect was sufficiently isolated so as to pose no potential threat to air traffic. During the emergency, residents close to the scene of the gunfire were directed to stay in their homes, away from windows, as the suspect had “been actively firing, sporadically,” Wahl said. Despite the continuing gunfire, police believed they had Colbert “safely pinned in his apartment,” he said. Nearby City Tree Christian and Washington Elementary schools were placed on lockdown status until the end of classes to make certain their students and staff remained out of harm’s way. Several St. Paul’s senior housing and child-care centers in the area also kept everyone secured indoors to be on the safe side. Crisis negotiators were able to establish an “open dialogue” with Colbert, who nonetheless continued refusing to surrender into the mid- afternoon, even after officers repeatedly fired tear-gas grenades into his apartment, police said. Following the arrest, officers recovered an “AK-47 type” rifle and a pistol that the suspect apparently had been armed with, Zimmerman said.